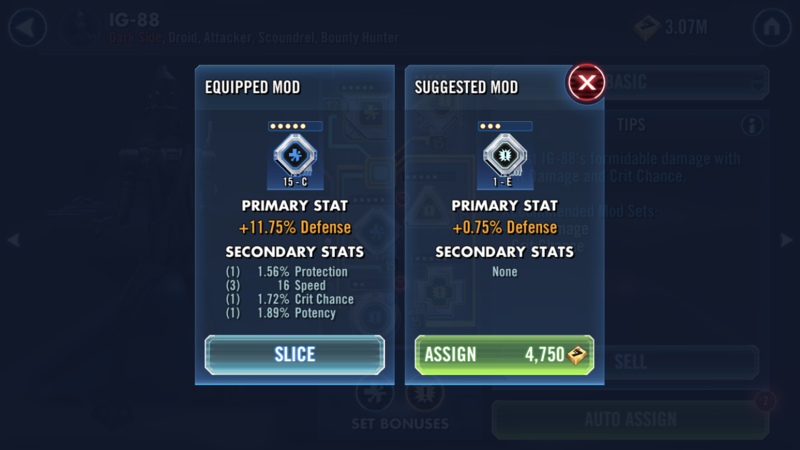 The mod suggestion is to tell you what set would work best for that character, then picks the best mod of that set. It's also just a suggestion and you can listen to it or not, your choice. @Mahbrethir I thought that that was referencing a different issue. 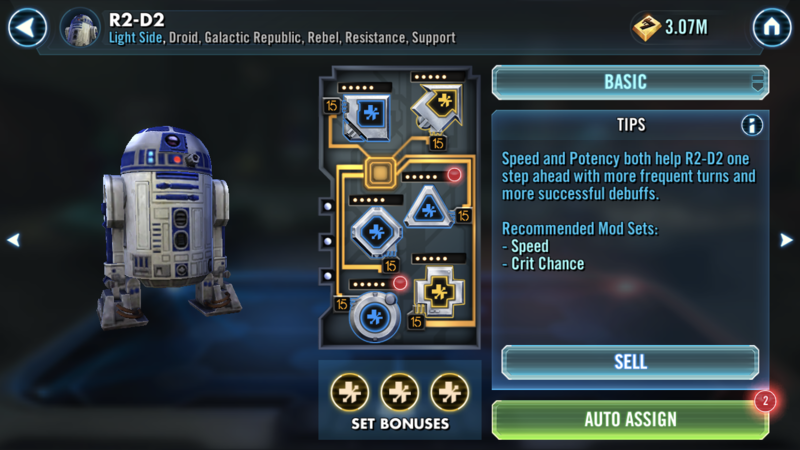 For example, for R2D2 it suggests potency mod sets, but then recommends crit chance mod sets. I think that this isn’t a bug, the game just thinks that the worst crit damage mod is better than a great health mod for 88, even though I already have a crit damage set active on him. I believe the recommendations are currently taking into account mod set and primary. Unfortunately, what it doesn't appear to take into account is the value of the primary, or any of the secondaries. That's all a theory based on the recommendations I saw in my own roster. The suggestion system was said from the beginning to be for players currently ignoring mods to get them engaged with mods with minimal effort. Yup, suggesting grey trash mk3 level 1 mods is sure to make them notice a huge difference in performance. Especially when suggesting it over and above blue mk5 level 15 mods with 16 speed secondaries, which they happened to equip without even knowing what they were doing. The suggestions are just plain bad, and the game would actually be *better* without them in their current state. The game is favoring set bonuses way too hard in the current patch. It completely ignores all secondaries as far as I can tell in an effort to get you to just wear something that matches the suggested set.